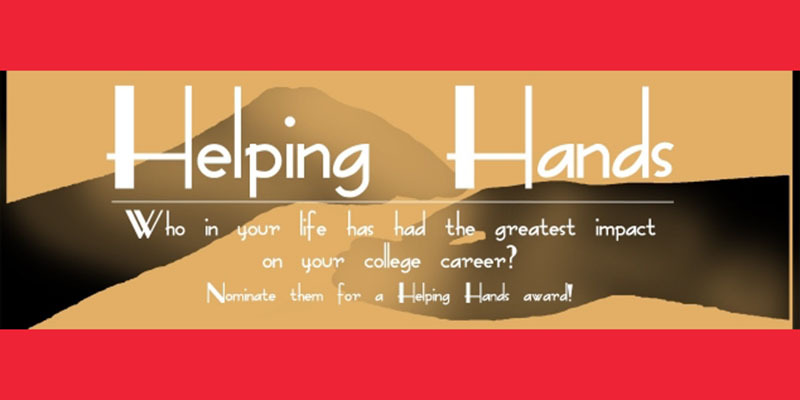 The 2015 Helping Hands Award Banquet celebrated the individuals nominated by 17 non-traditional APSU students for contributing to their academic accomplishments and leaving an impact on their lives. The event took place on Tuesday, April 7 in the MUC and gave each student an opportunity to explain why their nominee was important to their academic success. The nominees each received a pin in commemoration. Nominees were not restricted to family members, though many nominated their parents, spouses or children. Some students nominated their teachers, mentors and friends. Criminal justice major Kristin Coughenour nominated her daughter Kamey Coughenour for the award. “I don’t think you can be successful without the support of friends and family… no one is successful all alone,” Coughenour said. The award recipients were: Thomas Carvell, nominated by corporate communications major Tahji Peebles; Dawn and Andy Stepps, nominated by criminal justice major Jacob Crossno; Joy Choate, nominated by interdisciplinary studies major Brandi Sigears; Dr. Linda Davis, nominated by English major Julie Flowers; Ariel Kuwonu, nominated by mathematics and computer science major Dodji Kuwonu; Melinda Gaboury, nominated by interdisciplinary studies major Miranda Rowley; Kamey Coughenour, nominated by criminal justice and homeland security major Kristin Coughenour; Timothy David McNeiley, nominated by middle school education major Sherry McNeily; Scott M. Gordon, nominated by master of social work Katie Gordon; Michael Johnson, nominated by geology and mathematics double major Heather Capwell; Mike Andrews, nominated by fine arts major Samantha Black; David Mueller, nominated by nursing major Tabitha Austin; Vandy Watt, nominated by Elementary Education major Andrew Watt; Dr. Mike Gotcher, nominated by master in corporate communication Ethan Schmidt; Nathan Smith, nominated by business administration major Margaret Smith; and Halie Cooper, nominated by business management major Kali Cooper.